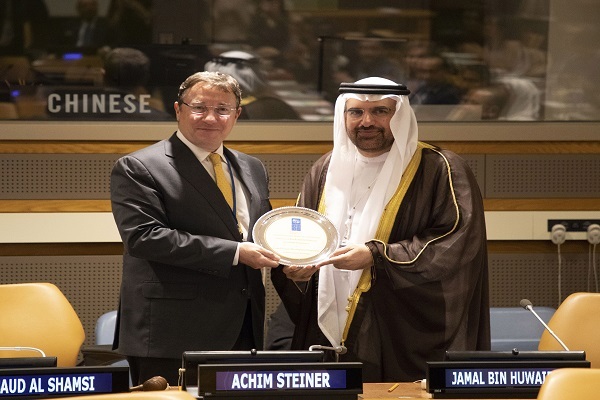 The United Nations Development Program (UNDP) has honoured the Mohammed bin Rashid Al Maktoum Knowledge Foundation (MBRF) as a “Knowledge Partner” on the sidelines of the General Assembly’s meeting in New York City. This is the first time any Arab organisation has been named “Knowledge Partner,” said a statement from MBRF. The UNDP sought to honour the Foundation to mark 10 years of close partnership, which resulted in several leading projects in the Arab region and the world. The ceremony was attended by MBRF’s CEO Jamal bin Huwaireb, on behalf of Sheikh Ahmed bin Mohammed bin Rashid Al Maktoum, the Foundation’s Chairman, in addition to Achim Steiner, UNDP Administrator; Saud Al Shamsi, Deputy Permanent Representative of the UAE to the UN; and Mourad Wahba, UNDP’s Deputy Assistant Administrator and Deputy Regional Director for the Regional Bureau for Arab States. The top UN honour is the culmination of the many international initiatives launched by the Foundation, most notable of which was the world’s first Global Knowledge Index, whose results were announced at the Knowledge Summit 2017, and covered 131 countries around the world. Highlighting the major milestones achieved during the decade-long partnership, Bin Huwaireb said: "The year 2015 witnessed a new and significant development in our relationship with the UNDP. That was the year we launched the Arab Knowledge Index, which seeks to track the state of knowledge in the Arab world on a yearly basis, taking into account the specificities of the region." "The flagship project was accompanied by the launch of the Knowledge4All initiative – an electronic platform serving as a reference for those involved in the knowledge sector," he noted. “The following year, in 2016, we sought to look into all of the knowledge initiatives currently underway in the Arab region and evaluate their impact on their respective communities. To that end, we launched the Arab Reading Index in an effort to measure the popularity of reading in our region and propose solutions for the challenges that face it. The Index succeeded in systematically debunking many misconceptions about reading in the Arab world,” he added. In his address, Steiner said that investing in knowledge should be a priority for any country trying to achieve the ambitious Vision 2030, noting that the partnership between the MBRF and the UNDP was rooted in a shared vision centred around knowledge as a means for sustainable development. Al Shamsi pointed out that noted that knowledge is the main engine for employment and economic growth, whereby entire categories of companies that were barely active on an international level are now dominating the headlines.